A one week vacation in the mountain air of Beatenberg, in the Bernese Oberland, in a charming chalet in the middle of pristine alpine meadows with an uninterrupted view of the Swiss Alps would be anyone’s idea of bliss. Then there are some remarkable facts about Beatenberg. Three of the village’s four areas, Waldegg, Schmocken, Spirenwald are spread out along the seven-kilometre village street, with the fourth area, Sundlauenen, situated down by the lake, making Beatenberg the longest village in Europe. It is also home to the legend of Beatus of Lungern, known also by the honorific, Apostle of Switzerland or as Beatus of Beatenberg. Legend claims that he was the son of a Scottish king, but other legends believe that he was born in Ireland. The St. Beatus Caves, near Beatenberg, celebrate the tradition that in this cave, Beatus fought a dragon. He presumably survived the fight and is thought to have died at a very old age in 112 AD. For me, however, there was one extra attraction to the natural paradise of Beatenberg, high above Interlaken. I have to thank Erich von Daniken for my love of reading. As a teenager, like many young boys, I hated reading. That is, until the time when all my friends were raving on about a new amazing book that proved aliens had visited us. So I saved up all my pocket money to buy Chariots of the Gods. Over fifty years later, that copy still sits on my bookshelf. The pages may have yellowed, but the words still work. So with the distant memory of my teenage discovery of an ancient astronaut theory, I headed off all those years later on my literary pilgrimage holiday to Beatenberg. It was a few years ago now but at the time, there was only one place that I wanted to see. I didn’t need a map to find it. Way below me, from my vantage point high in the mountains, I could see it in the distance below. 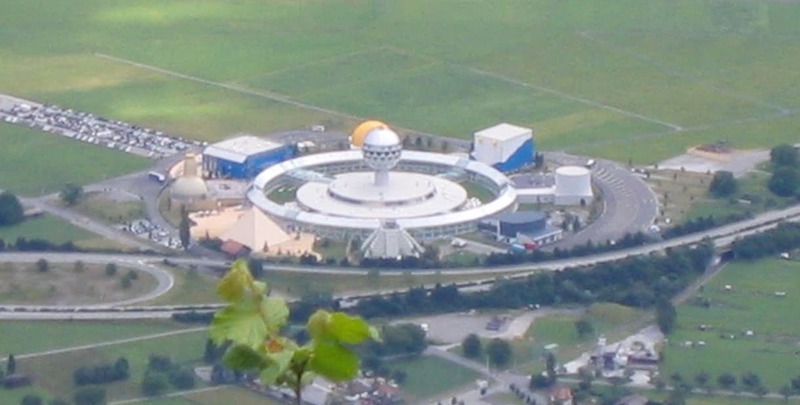 Mystery Park opened near Interlaken in 2003 and shut its doors in November 2006 due to financial difficulties and low turnout. It has opened once again, but it has been re-named JungfrauPark and caters more now for children. However, Mystery World is still part of the park and has some of the earlier von Daniken exhibits. The theme park was designed by von Daniken and consisted of seven pavilions. Each one explored one of several great mysteries of the world. The short-lived history of Mystery Park dates my visit. But luckily, I got to see the pavilions and experience a little more of his search for ancient astronauts and expanding on his wild theories. My visit to Mystery Park was about the same as to any other theme park. A lot of wandering around followed by emptying my wallet at the souvenir shop before leaving. The following day I trekked to see the Saint Beatus Caves. It was a tourist stop for sure. But my vivid memory is of a paper mache dragon that had definitely seen better days. Perhaps there was a similarity between St. Beatus and von Daniken. Both specialising in basing fact on theory, or muddling theories with facts. Yet, there was always interest in either fact or fiction. 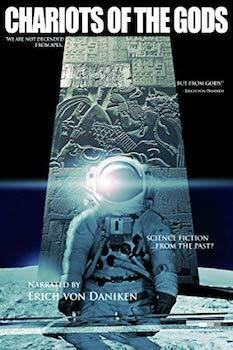 The book, Chariots of the Gods was adapted as a German documentary film, produced by Terra-Filmkunst. The film was released in 1970 in West Germany and first appeared in the United States the following year. It was nominated for the Academy Award for Best Documentary Feature at the 43rd Academy Awards in 1971. In 1993, von Daniken produced a 25-part TV series entitled Auf den Spuren der All-Mächtigen (Pathways of the Gods) for German television station, Sat.1. In 1996, a one-hour television special, Chariots Of The Gods – The Mysteries Continue, aired on ABC/Kane. ABC/Kane produced another television special with von Däniken the following year called The Mysterious World – Search for Ancient Technology. It aired on the Discovery Channel in the United States and on RTL in Germany. Well, that was it then? It was a very pleasant week away in the Bernese Alps. I had plenty to eat and drink, enjoyed myself immensely and took a bunch of holiday snaps. A lovely week, but it was time to start the long drive home. I drove down from the chalet, high in the mountains, to Beatenberg and stopped at the small shopping area to buy some snacks for the trip. As I turned in, I couldn’t believe my eyes. There he was. Standing at a small kiosk on my left, buying the Sunday newspaper. I checked and double checked as he chatted with the newsagent. Yes, it was him. 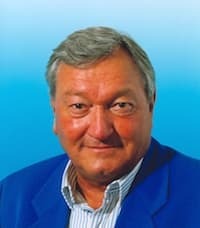 It was definitely Erich von Daniken! I drove on slowly, but as quick as I could to find a parking spot. In a small mountain village, that task is not always an easy one. Luckily it only took me a couple of minutes. I jumped out of the car and headed briskly towards the kiosk – with the intent of “accidentally” bumping into and meeting my literary hero of fifty years. Alas, luck was not with me. By the time I arrived, the kiosk was empty of customers, and famous authors. Well, I saw him, I think. That was enough I suppose, and the last act in my very traditional Swiss, Beatenberg vacation. It was the day I almost met Erich von Däniken. 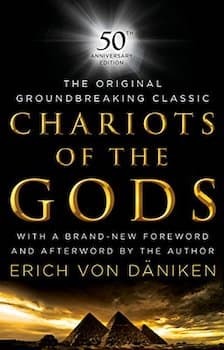 The 50th-anniversary edition of Chariots of the Gods is still a bestseller. Other books, The Gods Were Astronauts, Impossible Truths, Twilight of the Gods and Astronaut Gods of the Maya among many other titles are all remarkably popular with new readers. It seems that nothing has changed since I spent all my pocket money on a book, all those years ago. No matter what anyone says, von Daniken found his literary niche and is one of the most successful authors of the last fifty years. If you haven’t read any of his books, perhaps it is time for you to be transported to another reality. Where Did Mary Shelley Write Dr Frankenstein?